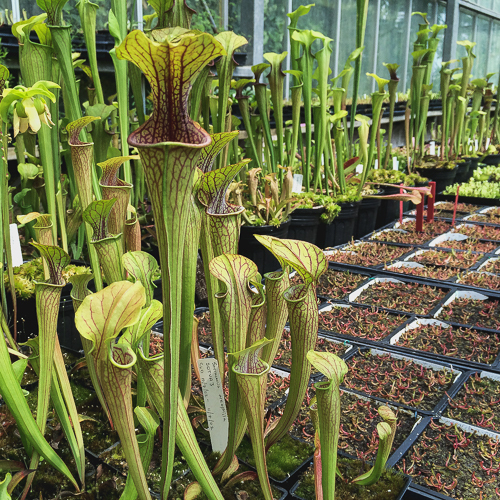 An hour north of Atlanta, tucked away in a remote pocket of the Atlanta Botanical Garden's Gainseville campus, is ABG's Conservation Safeguarding Nursery. 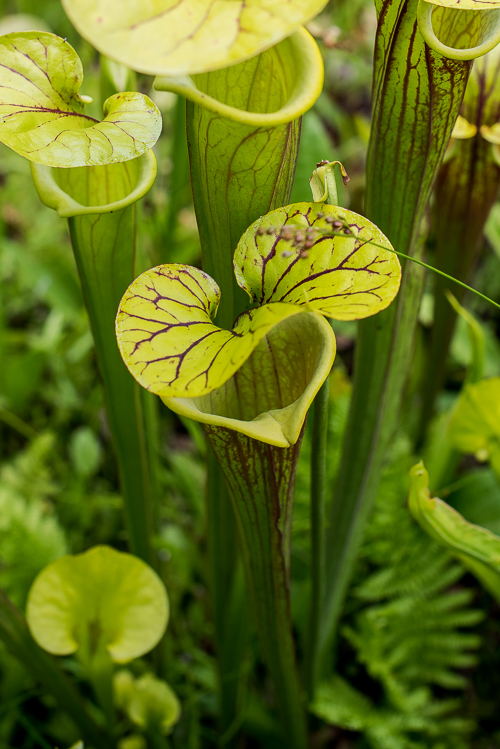 The wooden lath houses and raised beds contain the genetic riches of some of the most distinctive and critically endangered plant populations in the Southeastern United States: North American Pitcher Plants (Sarracenia species), Florida Torreya (Torreya taxifolia), and Georgia Plume (Elliotia racemosa). 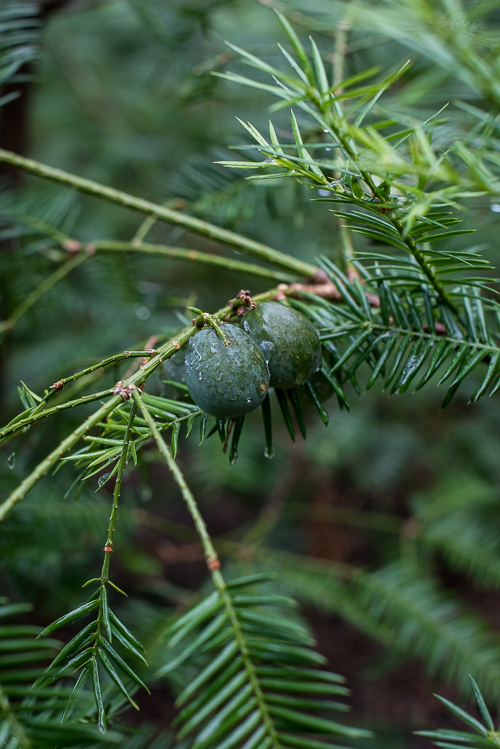 The purpose of the two acre nursery is to safeguard the genetic variation contained in specific plant populations that are on the verge of disappearing. Offsite safeguarding of a population's genetic diversity is a type of ex situ conservation which, like seed banking, supports in situ conservation efforts like monitoring, protection, habitat restoration, habitat management and reintroduction. Beyond safeguarding, ABG's Conservation Nursery ultimately provides material for reintroduction. The nursery, which is not open to the public, is tended by Ron Determann and his staff. I visited the nursery on an overcast Thursday and I was immediately enchanted. It was lush and still except for the rustle of the surrounding canopy and the intermittent call of a northern flicker. Among the most critically endangered ecosystems in the US is the longleaf pine (Pinus palustris) ecosystem, which historically occupied most of the southeastern coastal plain. 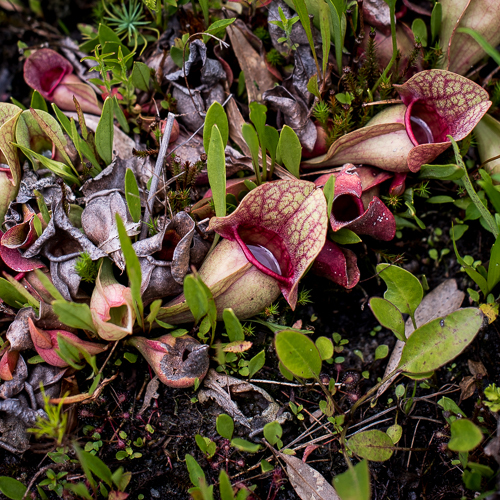 This ecosystem includes carnivorous plant wetlands, or bogs. Found in wet flatlands or seepage slopes, carnivorous plant bogs are characterized by wet sandy soils that are nutrient poor. 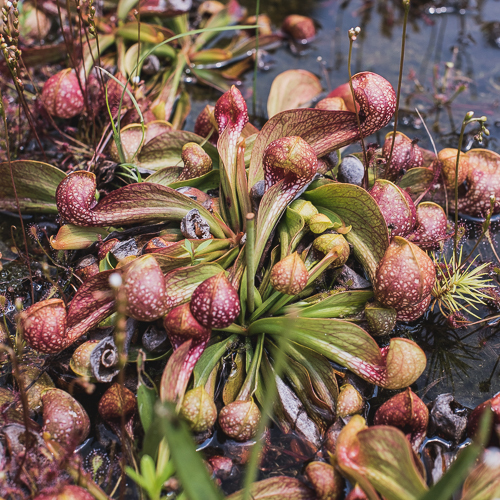 Current estimates suggest that carnivorous plant bogs now occupy less than 3% of its former range due to fire suppression, commercial forestry, agriculture and urbanization. 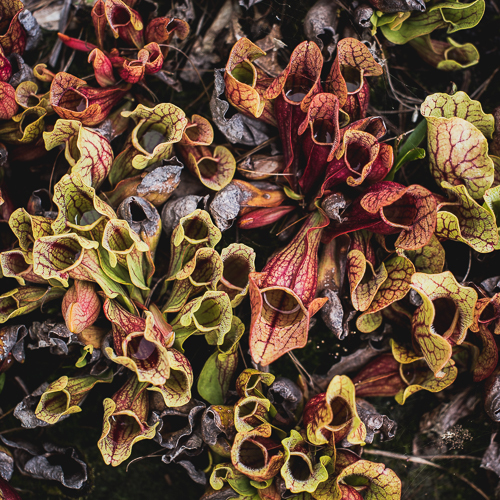 The vast wetland panoramas of stately pitcher plants that were once common in the Southeast exist in only a remnant of fragmented locations today. 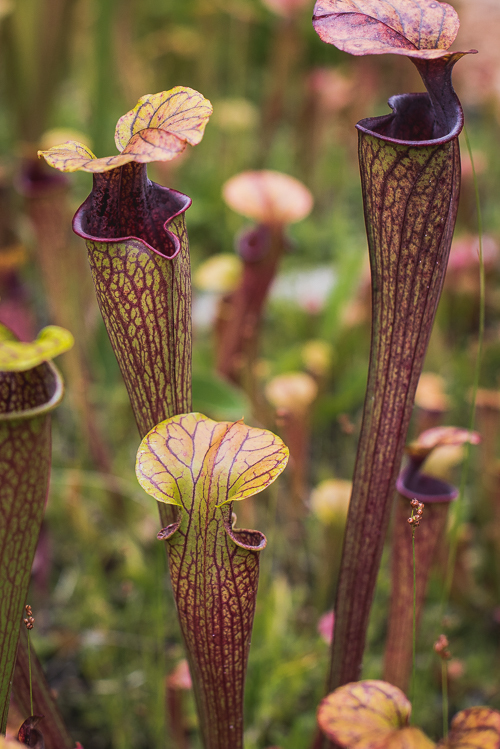 The most distinctive element of our Southeastern bogs are the carnivorous pitcher plants (Sarracenia species). 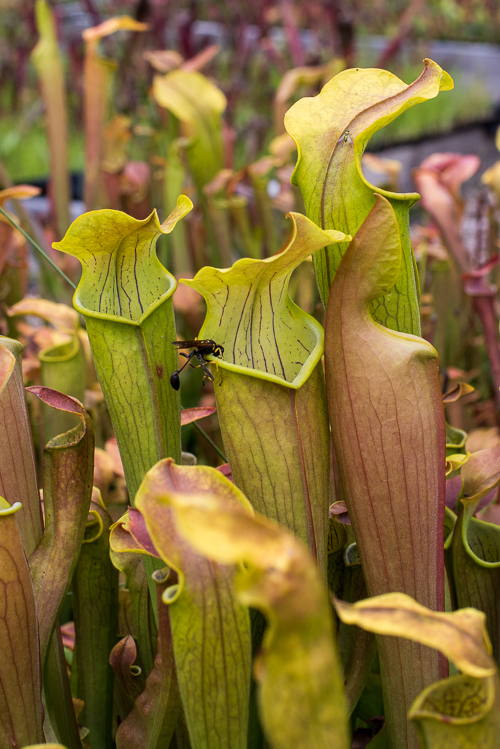 For the last three and a half decades, Ron has done pioneering work on the cultivation, propagation and conservation of Sarracenia species. 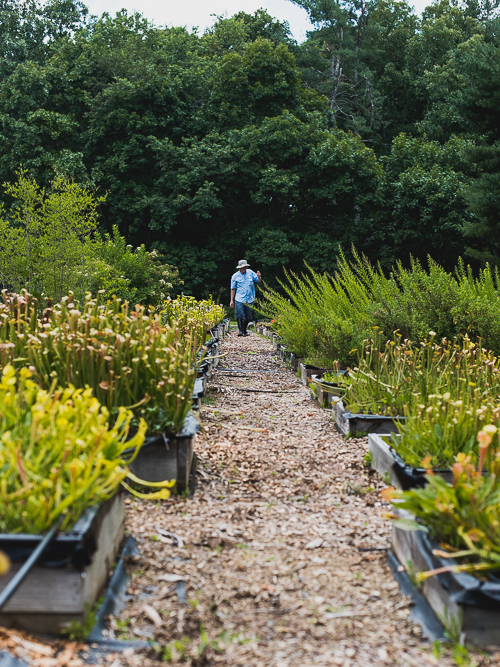 There are about 100 beds of Sarracenia at the nursery, with more under construction. 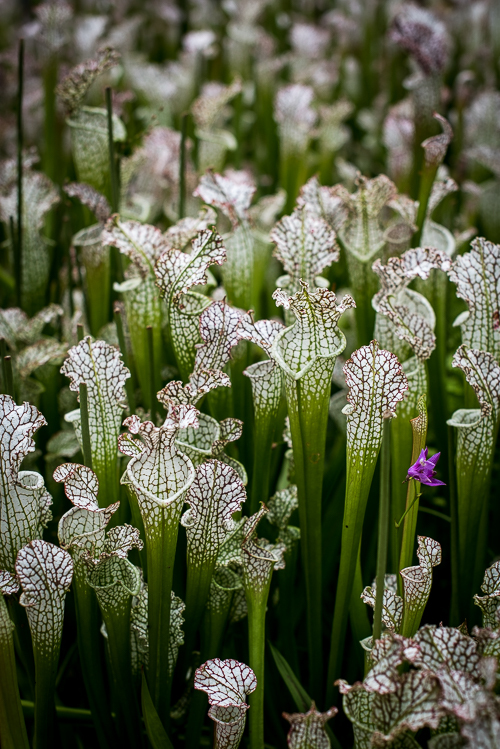 Over the years Ron has honed the sustainable growing of Sarracenia in long term cultivation. There are no potted Sarracenia plants. In order to replicate the sloping topography, sandy soil and high water table of their natural environment, Ron has designed ground beds with a sloping bottom, a liner, a sand layer, and a peat/sand soil mixture. The beds are joined by a drip irrigation system. 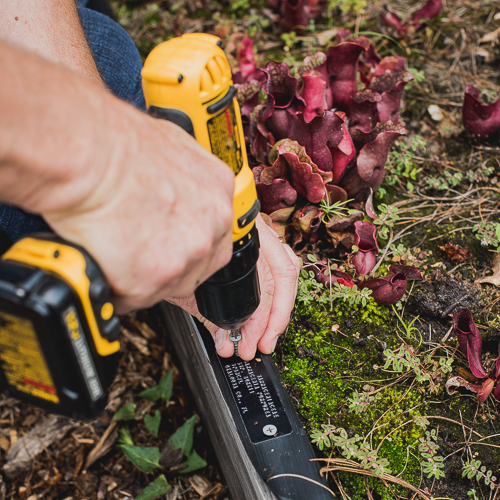 A properly built bed can sustain Sarracenia seedlings for a decade or more. 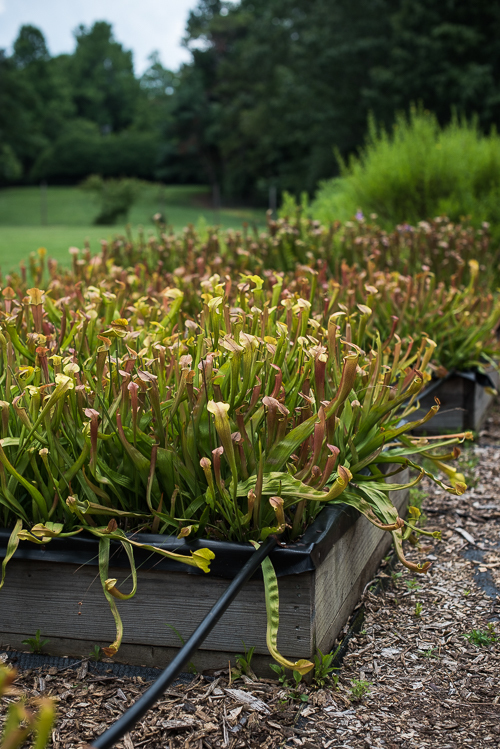 All Sarracenia plants in the nursery are first generation seedlings from wild seed sources; there is no hybridizing; and no seed is allowed to form. Each bed contains a sampling of the genetic diversity of a single population. 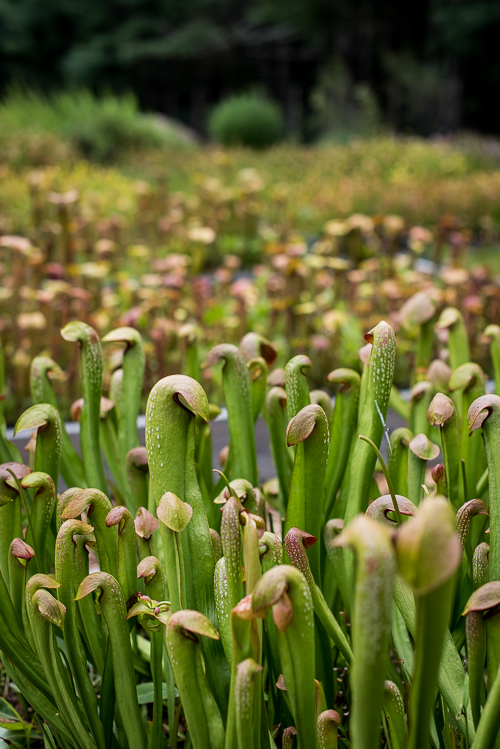 Each Sarracenia seedling or batch of seedlings is assigned a code name that identifies the population from which it came. The code name references GPS locality data for each population. When the seedlings are planted in a bed, a label bearing the code is attached to the frame of the bed. 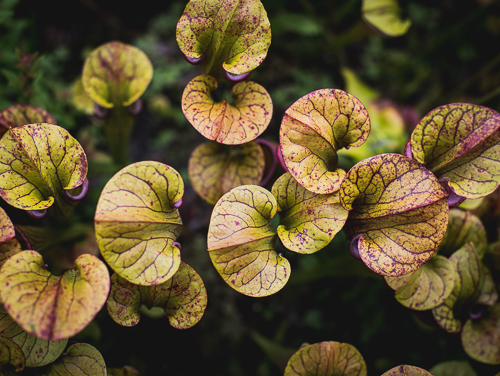 Sarracenia oreophila is one of three federally listed endangered Sarracenia species. Its remaining range consists of fragmented wetlands in Alabama and Georgia and adjacent North Carolina. It grows on sandy hillside seeps and river edges in areas with a distinctly drier autumn. Ron believes that its habitat was probably more open at one time. With fire suppression, its habitat has trended toward mesic hardwood with increasing shade. Some of the plants are in decline and he sees little seedling recruitment. Some of the sites are not properly protected and there are recent signs of seed poaching. ABG is working with the US Fish & Wildlife Service, private land owners, the Georgia DNR and Nature Conservancy to restore original populations. Some of the seedlings produced by ABG are used for restoration and augmentation. Of the known oreophila populations in the US, eighteen are represented in nursery for safeguarding. All known populations of the Federally listed alabamensis and jonesii are represented in this nursery. Both species grow in habitats associated with flowing water and gravelly or sandy soils. 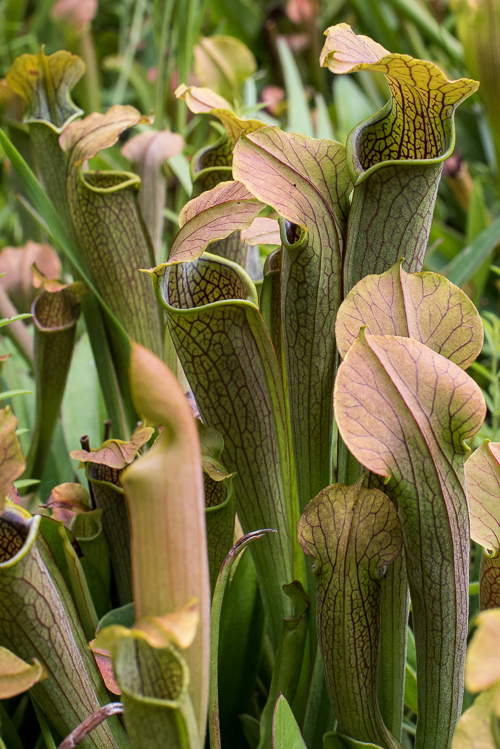 Sarracenia alabamensis is known from only ten populations in three counties in Alabama. ABG has helped in an advisory capacity and with restoring original populations on private land. Some of the populations have been augmented the F1 seedlings produced by ABG. Sarracenia jonesii habitat is among the rarest of carnivorous plant communities -hillside seeps or montane and cataract bogs- always restricted in distribution, and therefore vulnerable. It is not widespread from state to state. There are just 10 known populations in five counties in North Carolina and South Carolina. ABG has helped with restoration of mountain bogs in North Carolina. 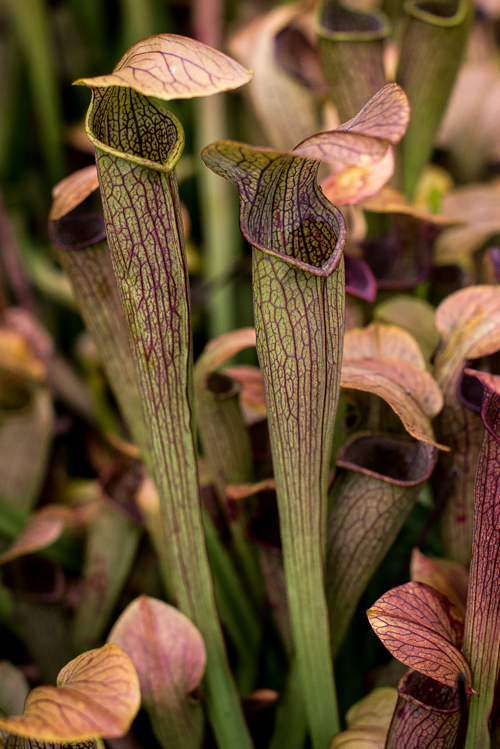 ABG has produced hundreds of Sarracenia rubra ssp. 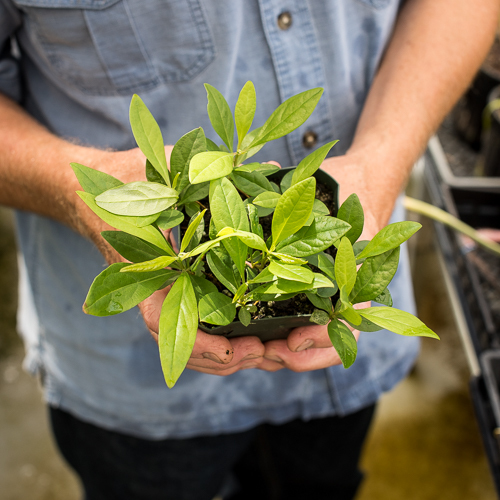 gulfensis seedlings for conservation efforts in Florida. 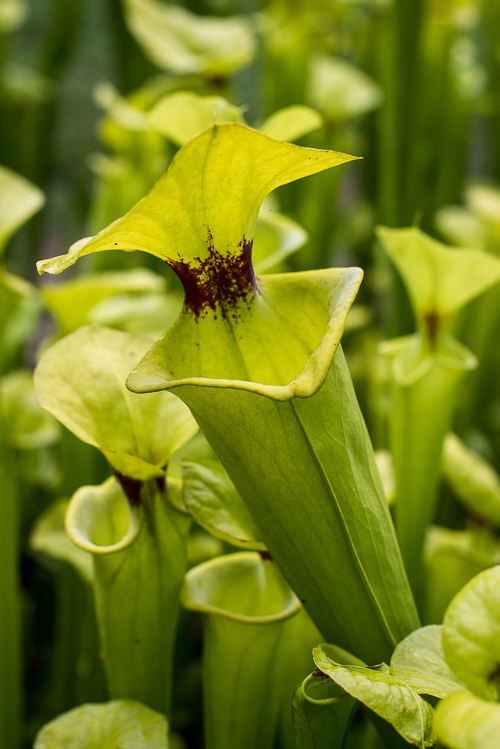 The only population of Sarracenia leucophylla in Georgia consists of a handful of plants on a power line easement belonging to Georgia Power. The site's water flow has been interrupted by irrigation to an adjacent field of cotton and soybean. Fertilizer runoff has further degraded the site. Without intensive management, the long term survival of the site is in question. 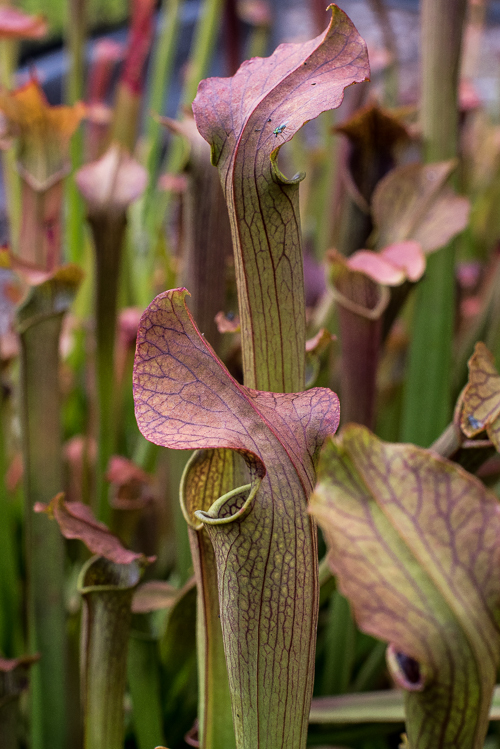 In Georgia, Sarracenia purpurea ssp. venosa is known from only one site. Historically, the site has had multiple owners. Currently it is in private hands and is managed by the Georgia DNR with the landowner's permission. Sites that are owned by private individuals can have an uncertain future. Torryea taxifolia (Florida Torreya) is considered the rarest conifer in North America and one of the most endangered in the world. It is endemic to cool moist bluffs and ravines along a 65 km stretch of the Appalachicola River in Gadsden and Liberty Cos. in Florida and in Decatur Co., Georgia. Estimates show that it has declined 99% since pre-settlement population levels, from an estimated 357,500 individuals in 1914 to 400-600 individuals in 2010. In 1984 it was listed as a federally endangered species. 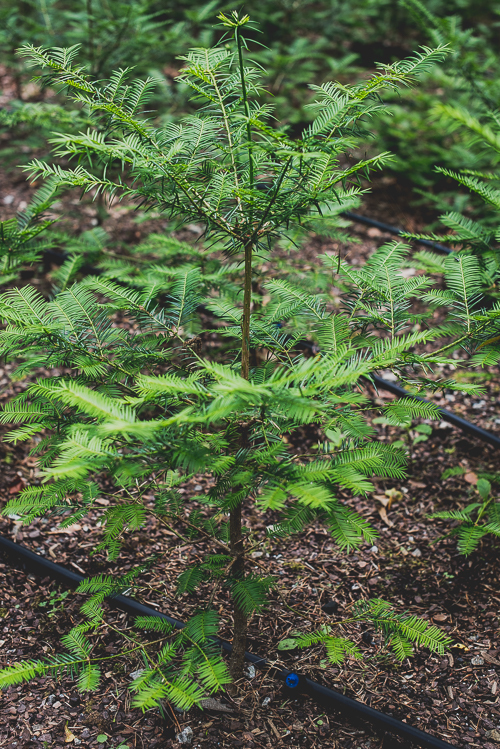 Florida Torreya has historically grown to 60' in the wild, but like the American Chestnut, most of the remaining trees are only stump sprouts between 1 to 3 feet tall. No one has reported seeing any seedlings in the wild in decades. The rapid decline is attributed primarily to fungal disease (Fusarium torreyae), but recent changes in hydrology, forest structure, additional pathogens and deer rubbing have also contributed. No naturally resistant clones have been identified. Its survival may depend on cultivation in botanical gardens, universities and state parks. ABG's safeguarding efforts with Florida Torreya started 1989. As the Center for Conservation's collection holder for Torryea taxifolia, ABG received 150 cuttings different genotypes from Arnold Arboretum. Currently there are 350 clones in two shade houses at the Conservation Nursery. Each cutting grown plant has highly accurate GPS locality data from the original plant. ABG's ex situ conservation program for Torryea taxifolia is the largest in the US. In addition to safeguarding, ABG has been working with the Florida Division of Environmental Protection and the Florida Park Service and the University of Florida to find, record and map each individual to better understand the distribution and survivorship of the current trees. Elliottia racemosa is Georgia endemic native to the coastal plain sand hills. It is classified by the state of Georgia as a protected plant. Its sites are impoverished by the use of herbicides in commercial forestry. There are about 35 populations in GA, but many are single clone populations. Elliotia is self incompatible, therefore in single clone populations it produces no seed. Ron has obtained natural seed set by planting a variety of genotypes in close proximity. 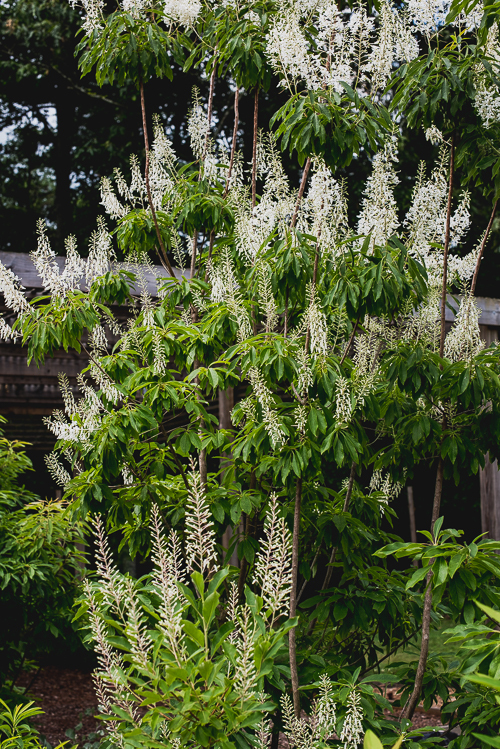 The seeds of this handsome tree germinate readily in cultivation. 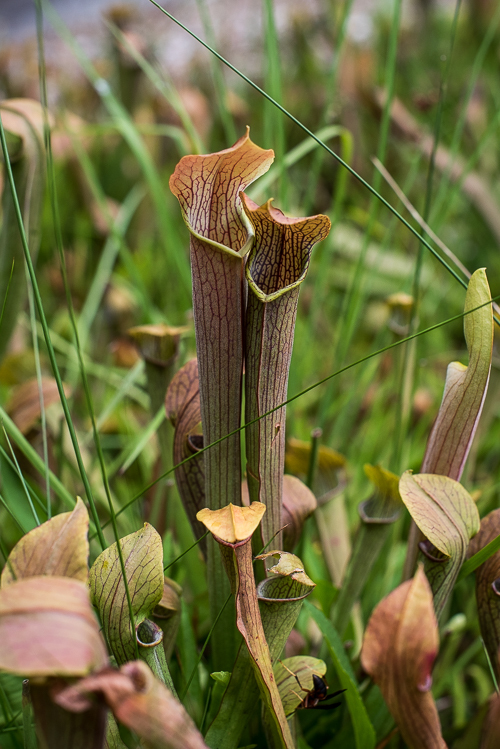 Sarracenia, Torryea and Elliottia are part of Georgia's disappearing natural heritage. Many of these extraordinary plants are unique to our area and are of global significance. ABG is helping to conserve them and the Conservation Nursery plays an important role in those efforts. Thank you, Hilary! It's a beautiful place. Maybe you can go with us one day.